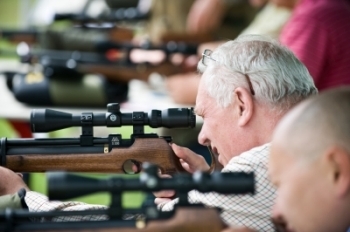 Not everyone feels confident enough to pick up a twelve-bore shotgun or to draw back the string on a powerful compound bow, so some of your guests may well prefer to test their skills with one of our high-tech airguns. With experienced shooters on hand to give the safety instruction, provide coaching and help set the telescopic sights accurately, even those who are nervous about taking their first shots soon develop their confidence and see their accuracy improve. There's no tedious pumping up of the air pressure to do between shots, because all of our air-powered guns are pre-charged using 'compressed gas' technology. Your guests just need to take aim and pull the trigger. Airgun shooting has the great advantage that a good firing range can be set up in a relatively small space. We can install the traditional moving metal silhouettes for your guests to shoot at, or set up tournament-spec card targets (which guests can take away after the session). 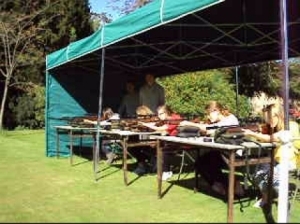 An ideal way for youngsters to join in the day, the air weapons are are a 'must-have' if you are planning an event that is likely to attract families. There is no lower age limit for shooting an airgun when under direct supervision and on private land, so we make every effort to give children a chance to shoot if they wish to do so and have parental consent.